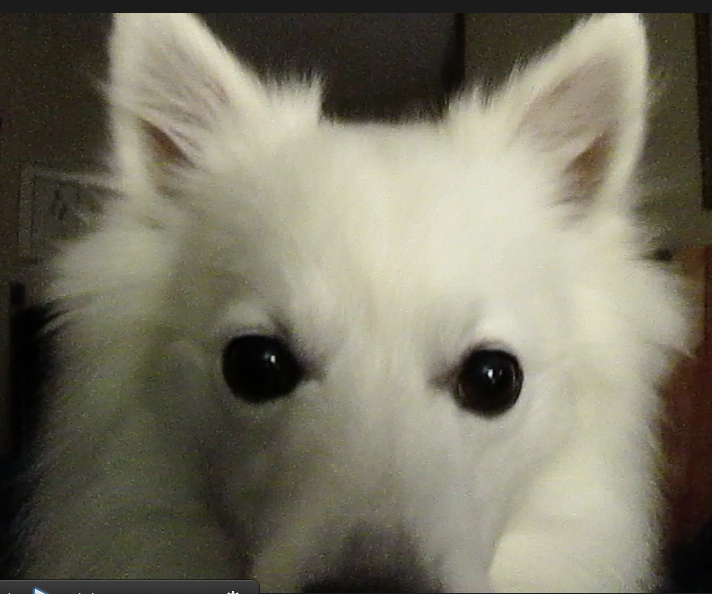 Brief update on the travails of Kenta the Wonder Eskimo. Hard tho it is for those who see him to believe, he’s losing hair at a highly abnormal rate. 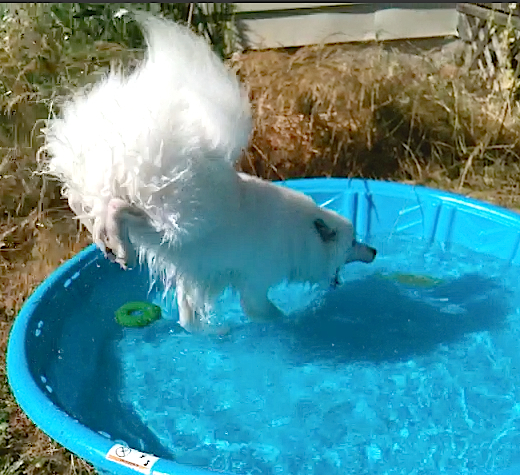 His fur is much thinner than it was this summer when the temperatures were in the 100s, & that just ain’t right. The hair loss has accelerated just over the last few weeks, so I have to wonder if it’s a side effect of one of the treatments for the SLO (auto-immune disorder) or something else. Here he is in all his heavy-fuzzed glory enjoying his kiddie (Kentie? )pool in August, when it was over 100. One of the things I’ve worried about since starting the SLO regimen is the diet; SLO attacks can be triggered by ‘attack’ proteins, so the dogs are put on very restricted diets –usually proteins that they’ve not been exposed to before, so their immune systems aren’t predisposed to get hysterical. A common restricted diet is rabbit & sweet potato, & he’s been on just that for… about a coupla months. I was concerned about Vitamin A hypervitaminosis, something I learned about after reading a number of books about Polar Exploration. There are some astounding, riveting books about the brave & insane men who explored the Polar regions & attempted to reach the Poles, & one of them is “Racing With Death,” about Douglas Mawson. Mawson was an Australian who ended up, at one point, plodding alone for about a month for hundreds of miles through subzero Antarctic wastes. Running out of food, he did what the explorers did in those days; ate his sledge dogs. Not knowing that there’s a reason that the Inuit never eat the livers of their sledge dogs, no matter how dire the situation, Mawson ate the dogs’ livers & developed Vitamin A hypervitaminosis (though they had no idea in those days what that was). The symptoms of what Mawson went through from this excess of vitamin A are unbelievably hideous; one of the more gruesome was the shedding of great sheets of his skin, including the entire bottoms of his feet (he felt an “awkwardly lumpy feeling” in his feet as he was trudging along, stopped, removed his fur boots, & found the compete soles of both feet had separated. He smeared lanolin on them, wrapped them back in place with string, put socks & boots back on, & trudged on into the frozen white. Folks were different in those days). He also lost huge sheets of skin from thighs, groin, & elsewhere. Oh yeah, Mawson also suffered hair loss. (You knew I’d get back around to the point eventually). Hair loss is also a symptom of excess Vitamin A. Only thing is, just how much Vite A is too much in canines is poorly understood. Like all the fat soluble vitamins (A, E, D, K), bad things can happen to any body when you dump too much in, because it doesn’t flush out like the water soluble vitamins (which is only one of the many reasons the whole ‘megavitamin C’ craze is asinine; all you do is supplement your sewer system with whatever Vite C your body doesn’t need at the time, since it is literally flushed out with bodily water). So, nobody really knows how much is too much when it comes to Vitamin A in dogs, though they’re not as easily overloaded as humans. Since it’s another stupid holiday in the middle of a glut of holidays, I can’t talk to the vet til the middle of next week, to start trying to figure out which of the myriad possibilities might be behind the hair loss. Many of the possibilities aren’t too bad –hypothyroidism is one, tho he was just tested a couple months ago. I’ve been hypothy for over 30 years, & it’s no big deal. Many of the possibles are horrific…Canine Cushings is one, & since my previous Eskimo died of that, to say that this hasn’t helped my stress levels is one of the understatements of all time. Portrait of the sweetie as a young dog. 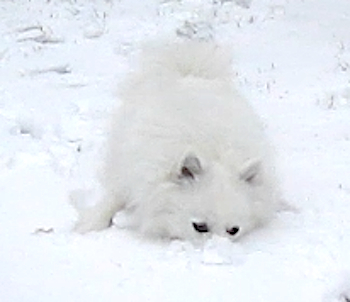 Is it any wonder that the first time I saw an Eskimo puppy I had to have him? 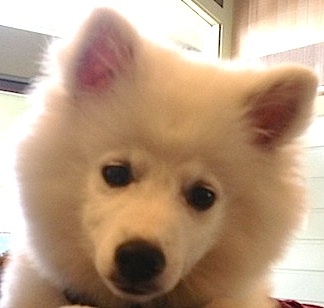 This is Kenta at about 10 weeks. Then there’s stress: could he be picking up on my drastically raised stress levels from recent catastrophes, starting with his own SLO diagnosis? How’s that for cruel irony? I lost about half my hair before I finally had the sense to jettison my ex-husband (the one I refer to as “The AntiChrist”…he was not a nice person). It grew back. There’s a constant, underlying level of stress involved in loving dogs (and cats), at least there is for me. Like the near-subliminal hum of being under high-tension wires, the visceral terror of knowing that I could lose my beloved friend is always there, though usually I’ve at least had the comfort of it being reduced when the animal is very young, like Kenta –he’s not yet 3 years old. Anyone who responds to this idea with something like “good grief, it’s just a dog [cat]” is someone who might as well be from a different planet on this subject; for me, no he’s not “just a dog” & Foster is not “just a cat.” They are beloved, adored friends, always true, innocent of cruelty or evil intentions. They are a part of my soul, a huge part of the reason I’ve been able to deal with chronic pain and numerous health disasters of my own. Kenta especially, in the last year or so, has literally kept me from seriously considering checking out of this miserable, hopeless existence (i.e. suicide). No matter how hard I try or what I do, damn near every time I turn around some great load of cosmic crap dumps on my head (or house or car) from out of the blue, and I don’t have the psychic or especially the financial resources to shovel out from under repeated catastrophes. My doctor first recommended I apply for disability because of my migraines in 1989; I was so appalled and horrified that I damn near fainted; I wasn’t going to stick out my hand for someone else to put money in it. I tried to keep decent jobs for the next 20 years, despite being completely out of action 15-40% of the time, with no warning, never any idea when or how long I would be struck down with literally blinding pain that kept me in bed for up to a week at a time. Achieving professional or financial stability & resources under those conditions ain’t possible. I surrendered in 2009, when I spent the last 7 out of 8 weeks of my last job unable to get out of bed except to go to the bathroom. I wanted to die from the shame of it…somehow I ended up with a deep conviction that it’s valid for other people to need help, but I’m supposed to be able to take care of myself. So now I have an old doublewide trailer that’s in okay condition. I live as cheaply as I can; I get my clothes from the free church resource or garage sales or St Vinnie’s (Goodwill is too expensive). I try to raise money by selling Mom’s jewelry & stuff I make on Etsy and ebay. And I have my dog and my cat. They are my luxuries, where I ‘treat’ myself. When I sell something online & am not too far behind on too many bills, I buy dog or kitty treats to celebrate. Foster hangin’ in his window hammock. And all this crap keeps happening, and I could deal with that, but with crap happening to Kenta, the level of terror gets so overwhelming I can barely breathe. Love so great comes with a fear of loss so huge, I sometimes wish I’d never gotten a dog or cat to begin with. But the joy I get from every minute with them makes me reconsider that. Then they get old or develop health problems young, and the cycle turns again and I fold into a fetal ball of fear. Kenta is telling me it’s time to stop fiddling with this useless thing that has nothing to do with him and start paying attention to the object of my affection, like, “Take me for a walk, Mom!” Wise folks listen to their heart, I s’pose. Or their dog…same thing, sometimes. Eskimo move known as the “Shnozz snow plow.” They have more fun in snow than anybody anywhere.